Cynful Nails: Pink leopard fantasy! Ultimate sweetness! Tell me, what can be more sweet and girly?? 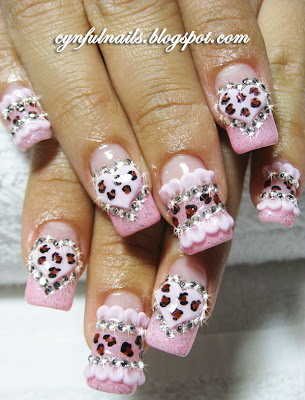 Super sweet pink gel glitter tips, with hand painted leopard prints, acrylic laces n puffy leopard hearts! Design from Dec 09 issue of Nail Max. ♥ ♥ ♥ ♥ ♥ ♥ ♥ ♥ ♥ ♥ ♥ ♥ ♥ ♥ ♥ ♥!!! !